It is no longer news that many public officers in Nigeria use their positions as a tool to perpetrate illicit activities thereby turning the country into a lawless society where gross misconduct and fraudulent activities can thrive with relative impunity despite the Anti-Corruption war chaired by President Mohammadu Buhari. Among these breed of opportunists is the Director-General of National Lottery Regulatory Commission, Mr Lanre Gbajabiamila, as investigations carried out by SecretReporters on him details him as being involved in fraudulent activities, gross mismanagement and abuse of office. SecretReporters in its quest to uncover the truth gathered that the hokey-pokey DG has utter disregard for the rule of law and an allergy for following due process in the commission which he oversees as he has delved deeply into swindling the commission of whooping sum of monies including a Land Cruiser V6 jeep which he purchased for himself at an initial sum of N57 million from Elizade Nigeria Limited. However, after the payment has been made, Lanre in order to syphon money during the commission’s meeting allegedly lied that the merchant complained that the particular model of v6 requested and paid for by the Commission was not available for immediate delivery and cannot be precise on when it would be made available. As a result, he suggested that the commission add the sum of N12,322,222 (Twelve million, three hundred and twenty-two thousand, two hundred and twenty-two naira) so as to enable the merchant to deliver a V8 Engine model which they had in stock. 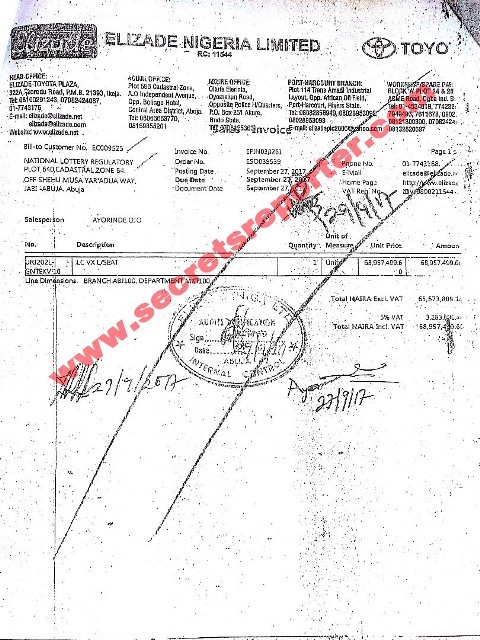 It was gathered by SecretReporters that the Commission approved of his request with the sum of N11,089,999 paid to the merchant on the 26th of September 2017 to purchase the higher model as against the initial demand with one Mr Ayorinde being the salesperson in charge of the purchase. 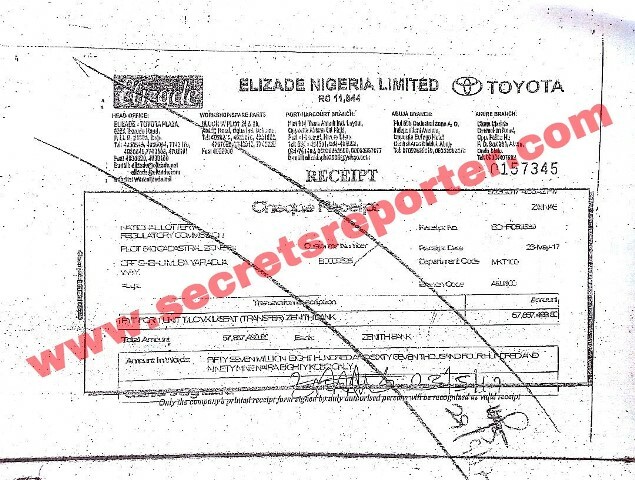 Documents in our possession revealed that this unrepentant DG without blinking allegedly proceeded to lavish a jaw-dropping N81million of tax-payers money from the commisions purse in procuring the said version of car. This purchase we learnt was not in any way done following the appropriate procurement guidelines as he singlehandedly picked the contractor he wanted to make the supply as against the due process of bidding in the commission. It was further revealed that the whole request for extra cash and the procurement of the vehicle which was already budgeted at a bloated rate, far above the market value of N55,000,000 (Fifty-Five million Naira) was all a charade in his scheme of ripping the commission of more than N26 million which he purportedly pocketed as a share of his “National cake”. It was also discovered that the invoice of the procurement contradicts the official receipt tendered as the invoice dated 29th of September 2017 reveals the sum of N76,619,444 was paid for the purchase while the receipt also dated 29th September 2017 shows the sum of 68,957,499 as the total sum paid for the procurement of the vehicle. Moreso in an attestation written by the merchant Elizade Nigeria Limited, it was evident that the purchase of the land cruiser was made specifically for the office of the director-general. 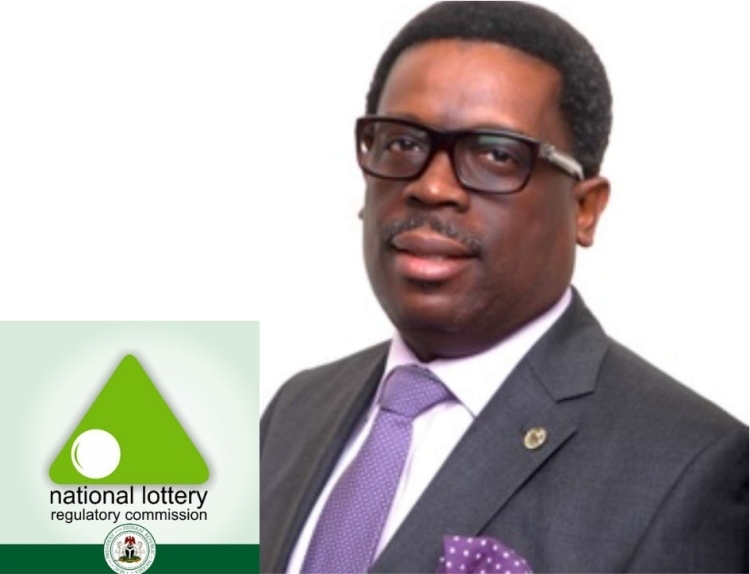 Sources within the commission also alleged that this is one of his many illicit practices which he has perpetrated with impunity overtime as he is infamous for flouting regulations guiding the conduct and administration of public offices especially that of the Lottery Regulatory Commission. Lanre is the brother to the House of Representatives Leader, Femi Gbajabiamila, who we gathered used his influence through Bola Tinubu to get him appointed, where he’s expected to oil the political wheel of selected political godsons and Lagos cabals. Calls placed from our newsroom to the director-general met a brick wall as he declined to comment, insisting that he doesn’t grant interviews over the phone. He neither confirmed nor denied the allegations.